This Triplex locomotive was built by Baldwin in 1916 for use a pusher engines on coal trains on the Virginian's 13.4 mile Clark's Gap (2%) grade across the crest of Flat Top Mountain in West Virginia. When built, it was the heaviest (844,000 lbs) and more powerful (tractive effort: 146,000 lbs) locomotive in the world. The locomotive was a compound, with 2 sets of high-pressure cylinders and 1 low-pressure set, but all three sets were of identical size, a deviation from the typical compound-articulated design of using larger high-pressure cylinders. The Virginian's 2-8-8-8-4 Triplex was never as successful as hoped and only one was ever built. Although the VGN loco used a larger boiler than the Erie Triplex it couldn't keep up a good head of steam. The Triplex was shipped back to Baldwin and rebuilt as two locomotives -- a 2-8-8-0 (pic) and a 2-8-2 (pic). The 2-8-8-0 was used successfully in pusher service, but since the Virginian's pusher locos did a lot of backing up (13.4 miles worth) on the rather curvy Clark's Gap grade, a trailer truck was soon added to the 2-8-8-0, turning it into a 2-8-8-2. Both the 2-8-2 and 2-8-8-2 were used in service until the end of the steam era. After the Triplex failure, Baldwin went back to the drawing board and came up with the Virginian 2-10-10-2 design, which worked out very well. The Virginian had hoped to be able to move 55-car trains using a Mallet on the front together with the Triplex pushing on the rear. Instead, the Virginian ended up being able to run 75-car coal trains up Clark's Gap (at a maximum speed of six to seven miles per hour) by using a 2-8-8-2 Mallet on the head end, along with two of the heavier, more powerful 2-10-10-2 Mallets cut in the middle and end of the train. The two pushers were dropped off at the summit of Clark's Gap and from there the single 2-8-8-2 Mallet handled the train to the end of the freight district at Princeton, WV. The two 2-10-10-2 pushers then returned (running backwards) down the 13.4 mile grade to Elmore, WV, where they were fueled and serviced in preparation for being used as pushers on another coal drag up the grade. During the era, the Virginian managed to move 400+ cars of coal per day across Clark's Gap using this technique! Last edited by wva-usa; November 16th, 2012 at 02:48 PM. It should be noted that the Erie had a few built as well. As the title suggests, I thought I would start a thread on rare trains, the trains that you don't see everyday. I'll start with one from America, would anyone like an SD40-2.?. There are plenty of horns and tones in this one, and plenty of SD40-2's as well. That first video only had one SD40-2. All the rest were SD40T-2's. Its always seemed a bit odd to me that the designers of the triplex engines couldn't see the built-in faults. 1. They added 2 steam using cylinders but no additional steam producing capacity. 2. As fuel and water was used up - tractive effort decreased due the lesser amount of weight on the rear (tender) engine. The Erie triplex is available as payware from PaulzTrainzUSA. What about 'Big Bertha' (Or 'Big Emma', or simply 'The Lickey Banker'), built by the Midland Railway to bank trains up the Lickey Incline between Bromsgrove and Blackwell? Commissioned by me, pcas1986 has built her in Trainz and Decapod has a MSTS version too. Well, class 37's were frequent around 2-3 years ago, because I live near the Sheerness steel mill, which closed down. On another note, earlier this year, I saw 73201 'Broadlands' running light engine through Sittingbourne. 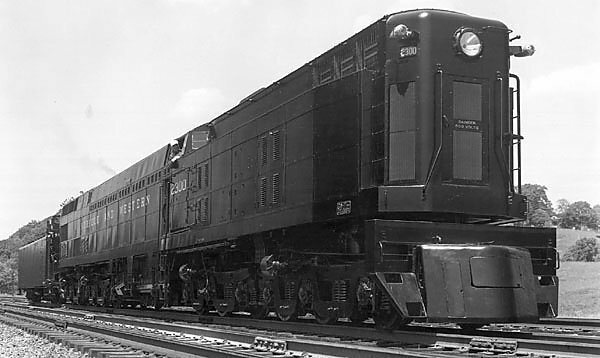 Two were built by General Electric and rolled out in December 1938. The Norfolk & Western steam-turbine-electric looks like a mean beast of a train! I'd love to hear the horn/whistle! The end of one journey can be the start of another. A journey never truly ends.